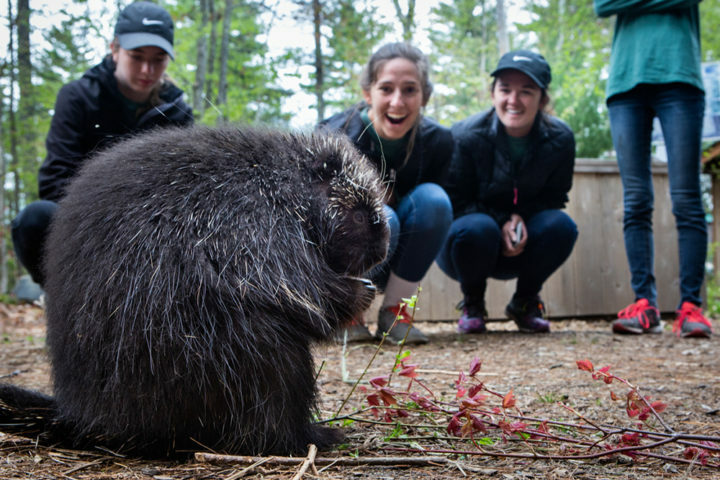 FRIENDLY BUT SHARP: College students visiting the the Center for Wildlife in Cape Neddick, get a kick out of Henry the porcupine. Henry is one of the center's ambassadors, taking part in school, library and nursing home programs. He was mistakenly thought to be an orphan by a well-meaning member of the public and taken from him mother. Now, the wild creature is too imprinted on humans to ever be released. 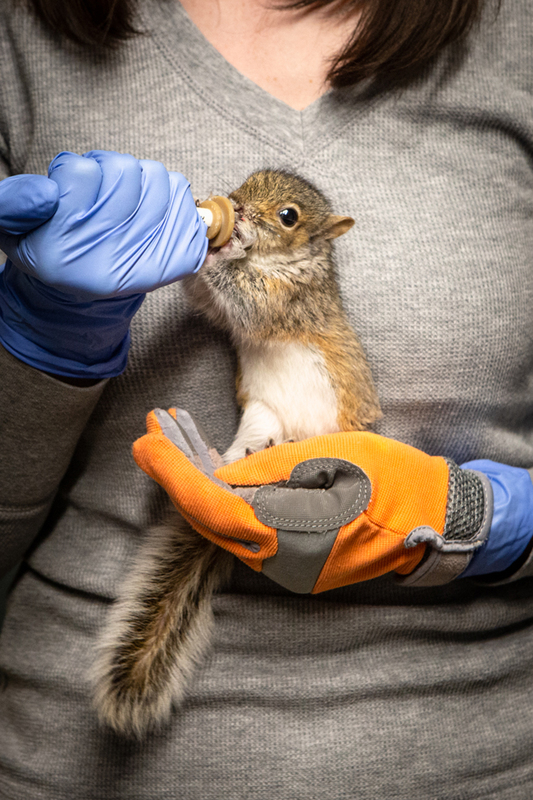 CAPE NEDDICK, Maine — When the folks at the Center for Wildlife finish feeding, weighing and cleaning all the orphaned baby squirrels in their care, they rest. Then, they start all over again. With about 80 whiskered faces to feed, there’s not much down time. There’s even less when you add the infant opossums, motherless birds and dozens of other wayward creatures also in their care. It’s endless work that, more often than not, is in vain. Most orphaned animals don’t make it. But some do. 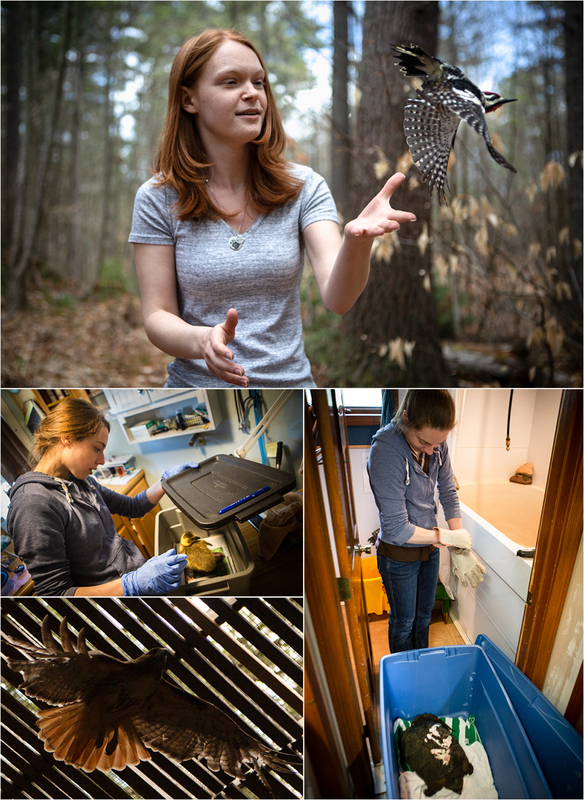 That hope, coupled with 32 years of sustained effort, has grown the center into the largest wildlife rehabilitation and educational facility in Maine. “We are one of 20 centers, in terms of size and scope, in the whole country. There aren’t many centers, like ours, that exist in the whole United States. What sets us apart, locally, is that we do both conservation medicine, as well as environmental education,” said Development Director Emma Balina. 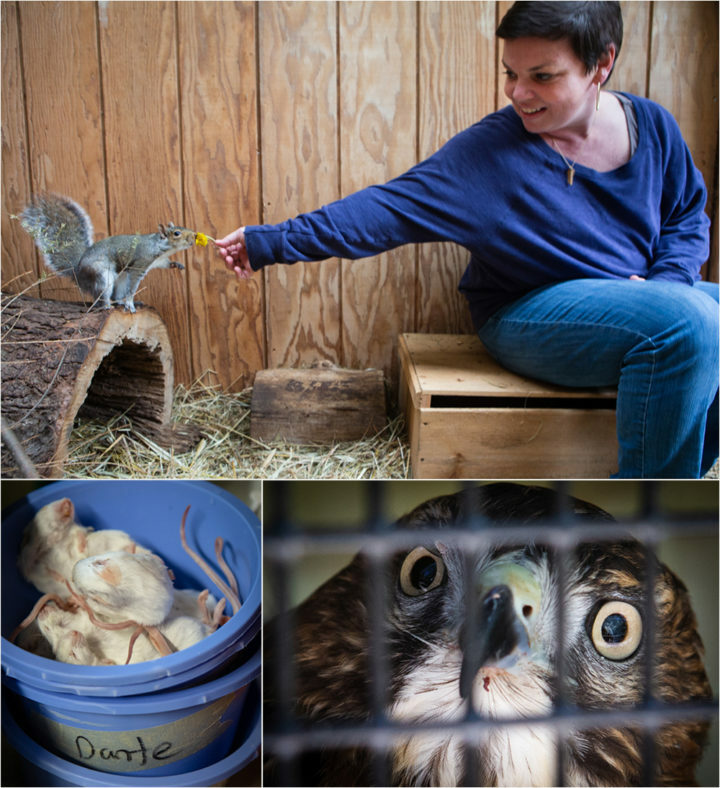 The Center for Wildlife treats nearly 2,000 injured and sick wild animals each year. It handles native creatures from small mammals to large hawks. Snakes, turtles, squirrels, mice, finches and owls all get the same level of care. Releasing them back into the wild is always the goal. 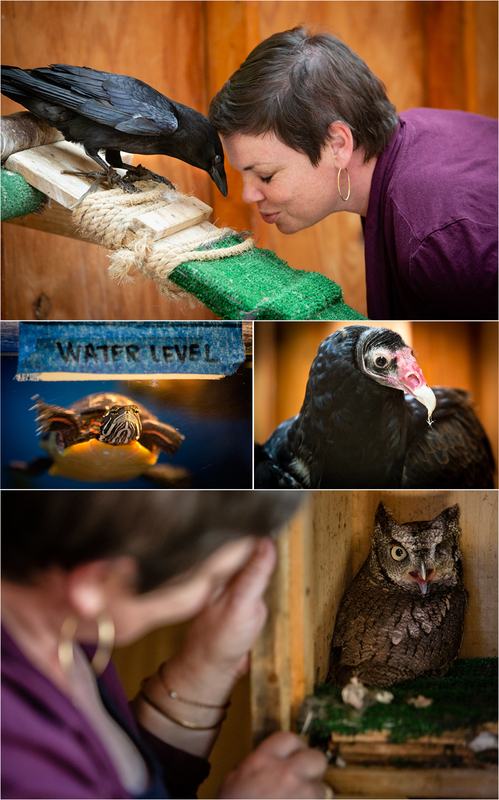 ANIMAL AMBASSADORS: Education and outreach coordinator at the Center for Wildlife in Cape Neddick, Sarah Kern (above top) offers Skeeter a snack in his enclosure. Skeeter, an eastern gray squirrel, is a permanent resident and ambassador at the center. He sustained neurological damage after being hit by a car and cannot be released. Frozen mice (above left) are doled out to some of the ambassadors like hawks, owls and falcons. Grace (above right) a broad-winged hawk, peers through the grille of her enclosure. She cannot fly due to extensive wing injuries — but never stops trying. The center also hosts around 20 “ambassador” animals that cannot be released. The ambassadors, which include a porcupine, a crow, a turkey vulture, several owls and an opossum, are used in educational programs. 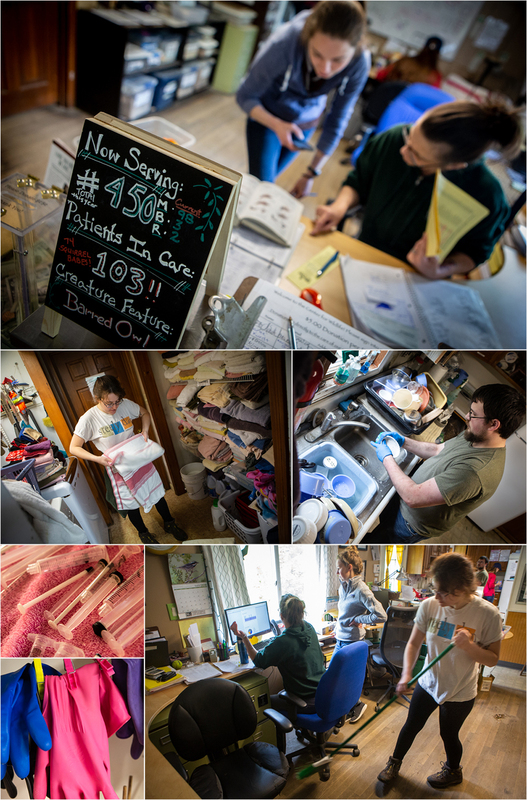 “We do about 350 education programs a year at schools, libraries, state parks, senior centers, nursing homes and community centers,” said Balina, who grew up in Bangor. The ambassadors have a standing engagement on a Portland television station and the public can visit with them at the center. 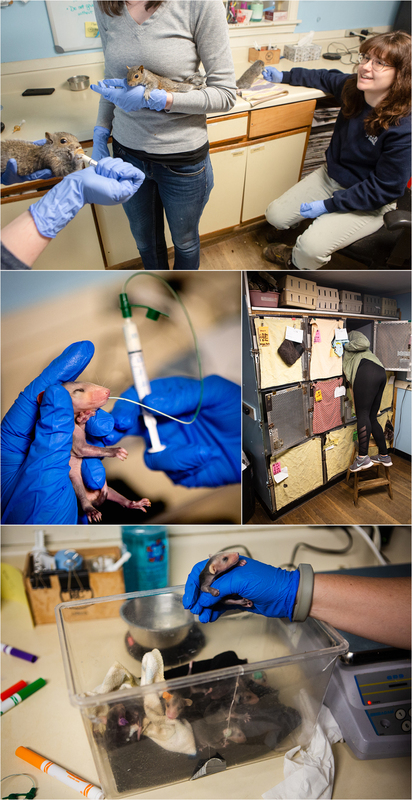 Doing all the work at the Center for Wildlife are about 80 volunteers, seven full-time staff members — all of them women — and about 30 college interns. This year, the center’s operating budget is $430,000. None of it comes from the federal or state government sources. The bulk of it comes from individuals, with education program fees, private foundation grants, and local businesses rounding out the rest. The Center for Wildlife was founded in 1986 by York state lawmaker Dawn Hill and Gary Beekman, a local veterinarian. At first, it operated out of a trailer with no running water or electricity. Now, the center hums in a crowded, 1,200 square-foot ranch house near the foot of Mount Agamenticus. Outside, there are close to 30 enclosures for animals on the mend and permanent ambassadors. Later in 2018, after four years of planning and fundraising, the center will break ground on a larger, purpose-built facility. The Center for Wildlife Assistance Hotline and Medical Clinic is available 365 days per year between 9 a.m. and 5 p.m. at 207-361-1400. – Use a towel to cover the bird. Use a dish towel for small birds or bath towel for large birds. – Place the bird in a well-ventilated box and transfer to Center for Wildlife or local rehabilitator. – Remember to move turtles across the road in the direction they were headed – they know where they’re going. – Large snapping turtles can be helped across the road by encouraging them to bite a sturdy stick and pulling them across the road on top of a towel to avoid scraping the underside of their shells. – If a turtle was hit by a car, please bring it to the center. They may be able to bracket its shell or extract eggs from a female. – Use a towel to cover the animal. Use a dish towel for small mammals or babies. – Place the animal in a well-ventilated box and transfer to the Center for Wildlife or local rehabilitator. – Keep the car as quiet as possible. Turn off the radio and talk quietly. – Keep pets away from the animal. – Most wild animals are in shock after being injured. Please avoid talking to, or holding, the animal as that can increase its stress. – Keep the animal warm. – Do not attempt to feed the animal. 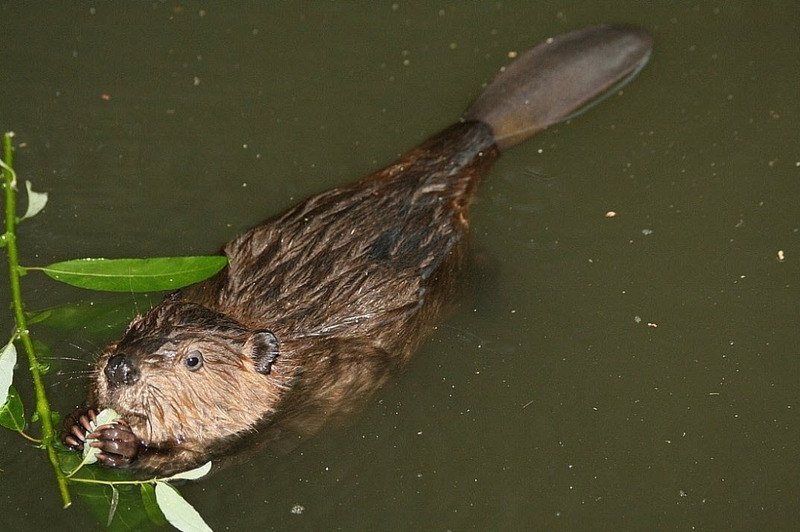 Wild animals have special diets and an injured animal could have internal injuries.